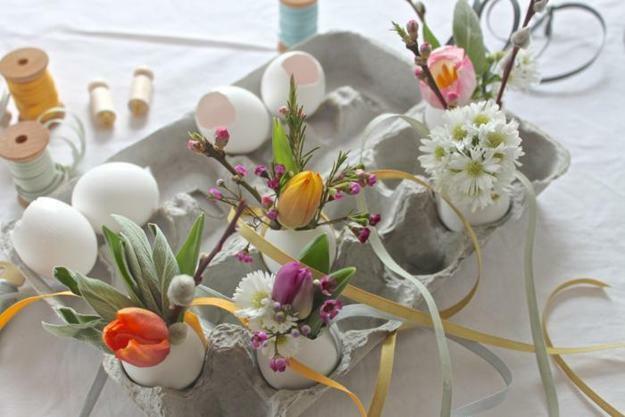 Recycling egg shells for miniature vases offer great ideas for spring crafts and make Easter decorating eco friendly, natural and interesting. 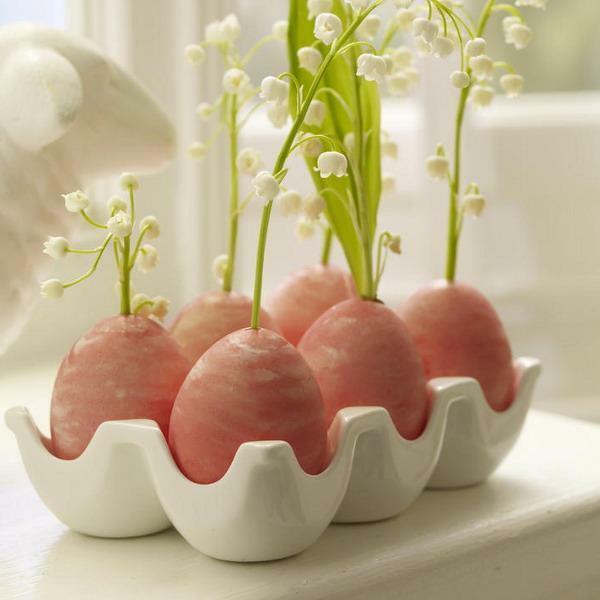 Egg shell vases provide wonderful containers for small spring flowers and plants and help create charming table decorations for Easter and all spring holidays. 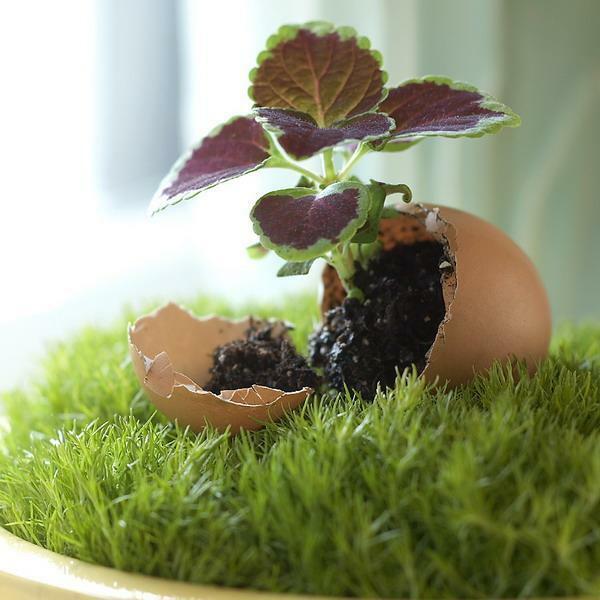 Lushome brings a collection of 25 Easter decorating ideas that demonstrate creative ways to recycle egg shells for spring table decorations. 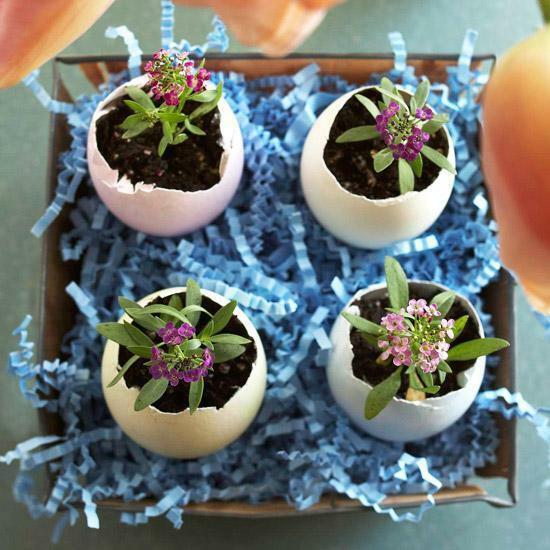 Miniature vases made with egg shells are simple and easy crafts. 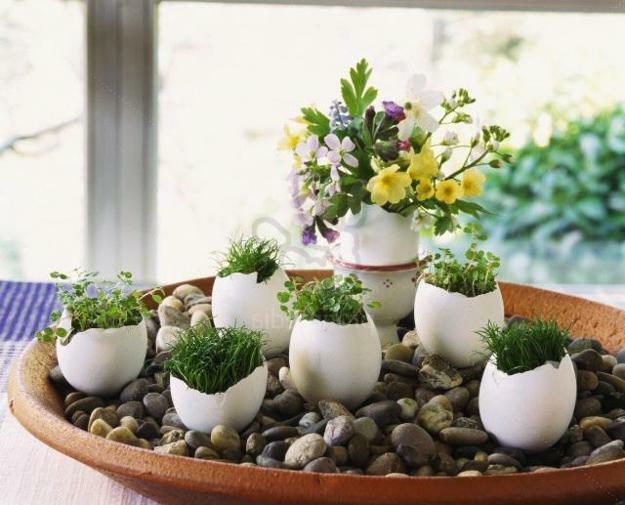 Hollowed-out egg shells look organic and beautiful, providing miniature vases for growing grass, small spring plants and flower arrangements. 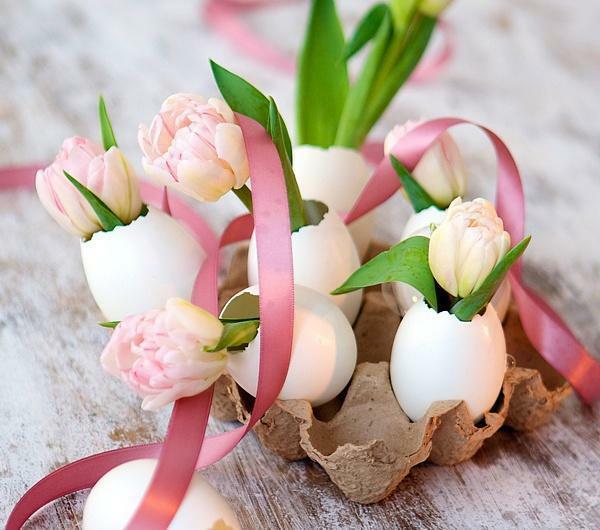 Egg shells make sweet little containers for tiny plants and unusual miniature vases for fresh flowers, perfect for Easter decorating. 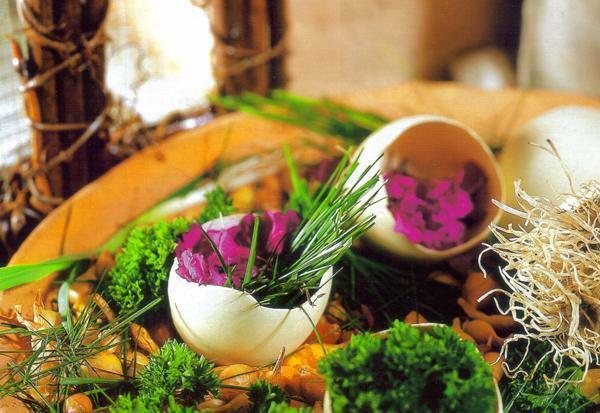 Egg shells look attractive and harmonious. 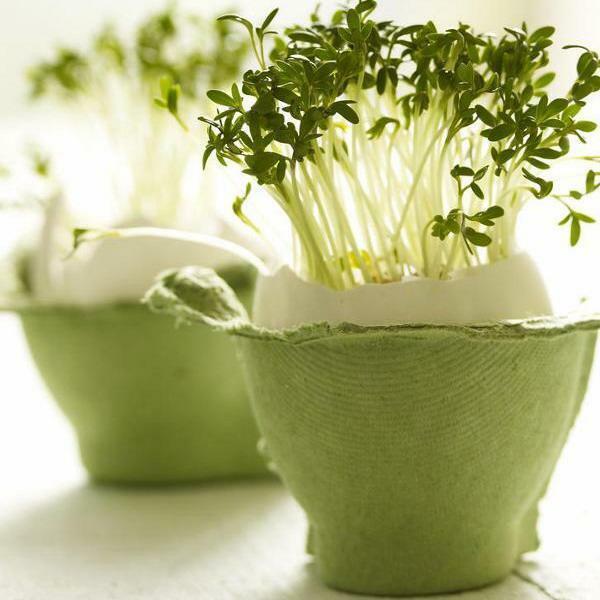 They are a versatile, suitable for any home decorating material, especially great for eco homes and small Easter decorations. 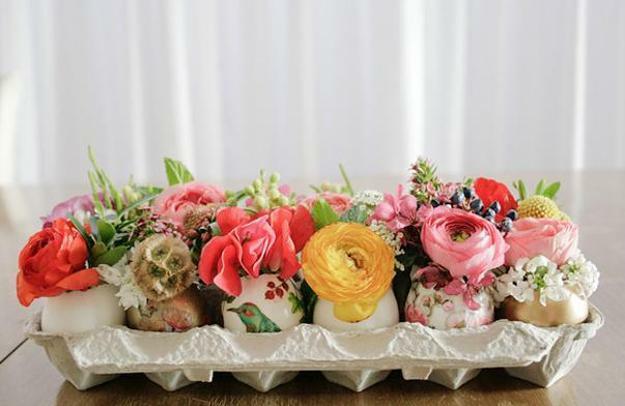 Egg shells vases with spring flowers make very attractive individual table decorations and fun centerpieces that add natural feel to Easter decorating. 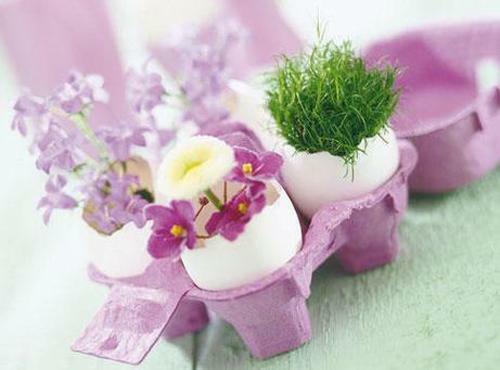 Tiny flower arrangements and spring grass look lovely in egg shell containers. 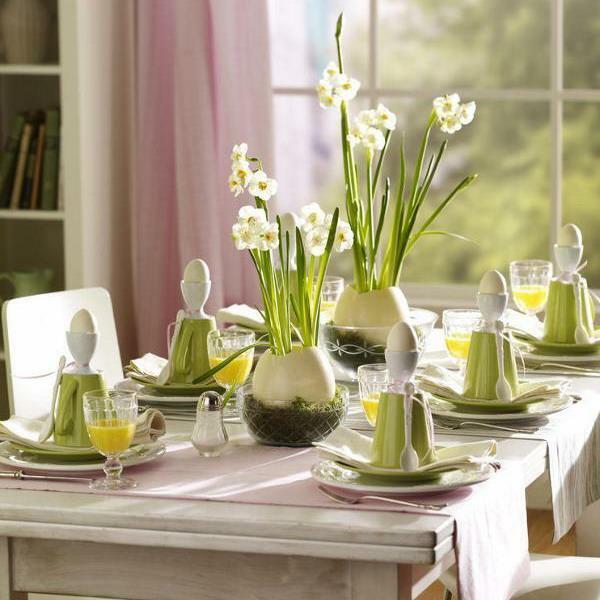 Fresh green colors and bright accents of spring flowers add unique charm to Easter decorating and holiday tables. 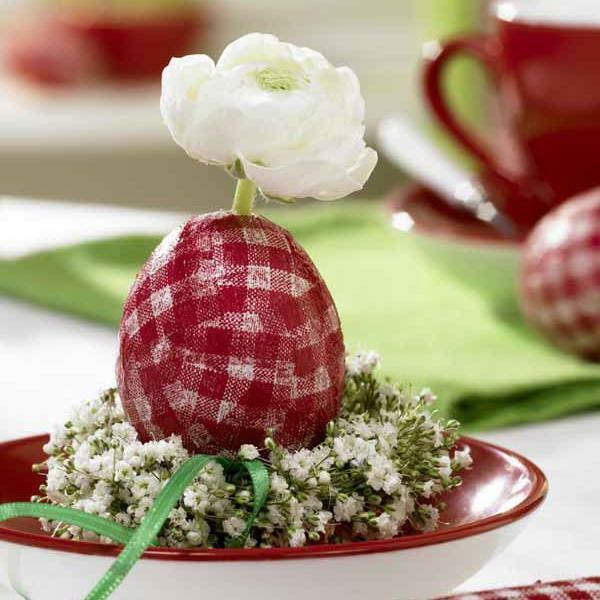 You can decorate empty egg shells with colorful fabrics, painted designs, beads or small buttons. 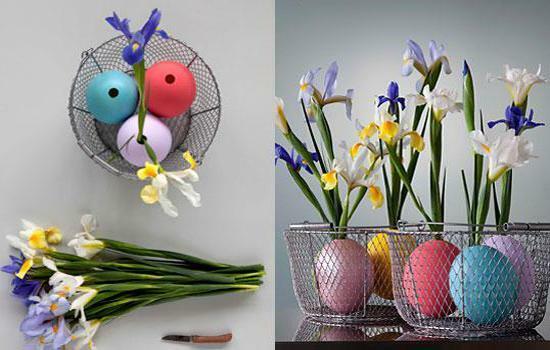 Candies and metal wire, tissue paper and ribbons are wonderful decorating materials for these unique miniature vases created with empty egg shells. 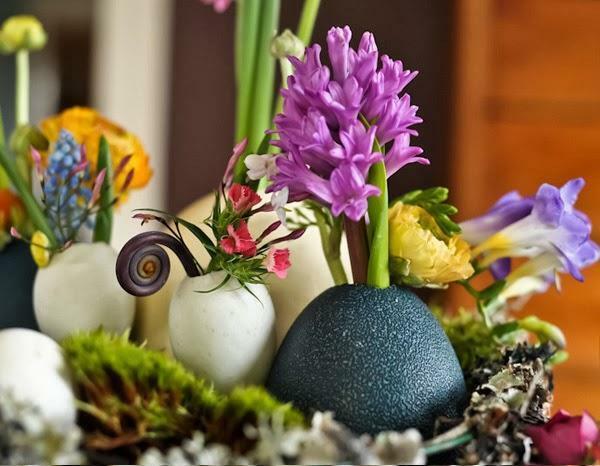 You can paint some motifs, create interesting and unusual designs or draw a simple note that can enhance Easter decorations by adding meaningful words to miniature vases and spring flower arrangements. 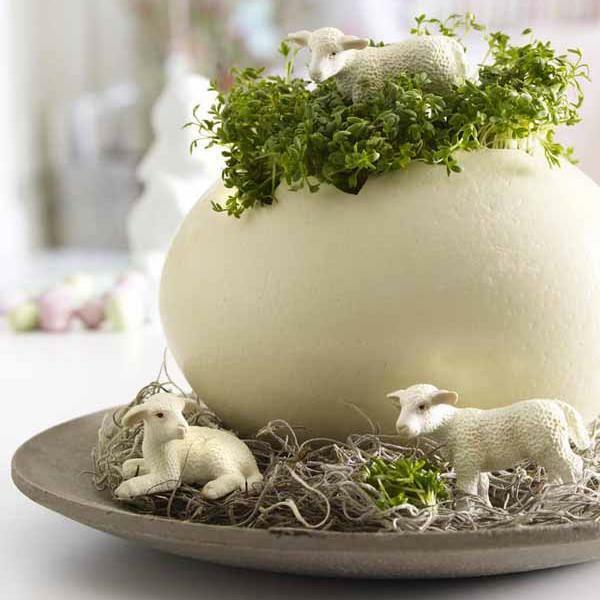 You can use lace and crocheted or knitted designs, write personal letters and numbers, allowing your creativity to turn egg shells into beautiful Easter decorations and very special gifts. 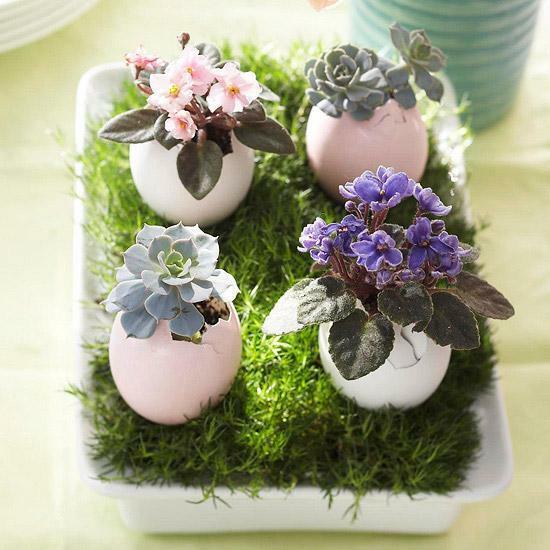 Add tiny flowers or plant spring grass and moss, creating spring table decorations and individual centerpieces for your Easter home decorating. 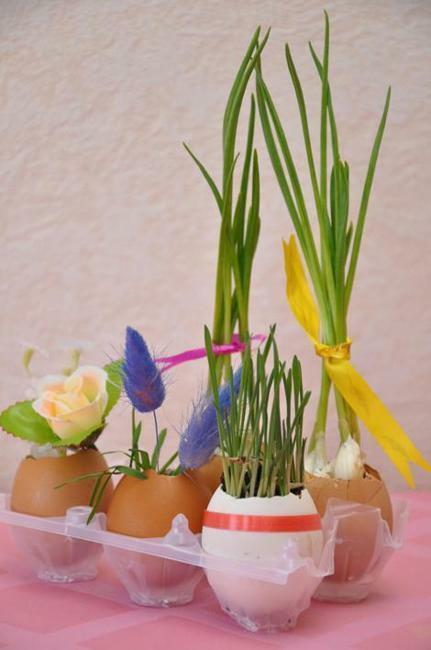 Simple paper crafts are great for decorating egg shell containers also. 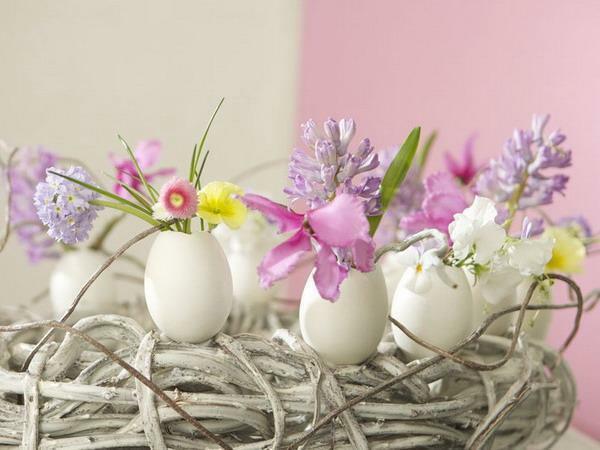 Different flower designs and wire pierced in them, which look like stems, make elegant Easter decorations for miniature vases. 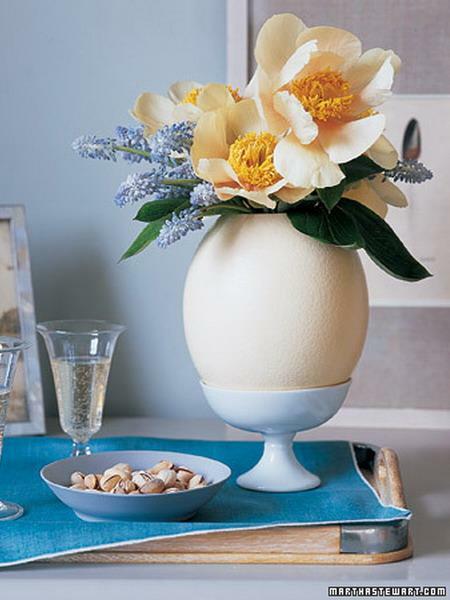 To make the vase, carefully break open egg near the top. 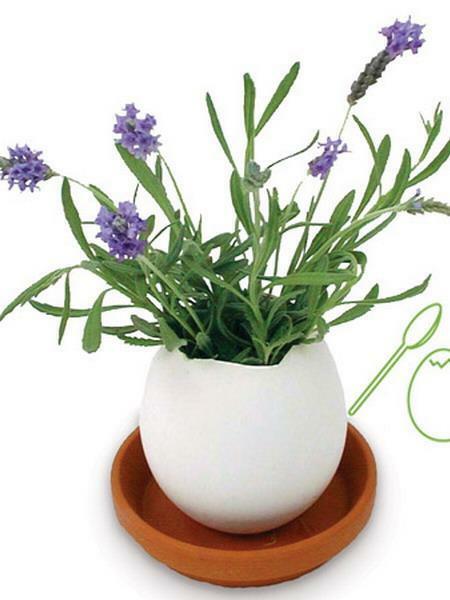 Empty the content of egg in a bowl. 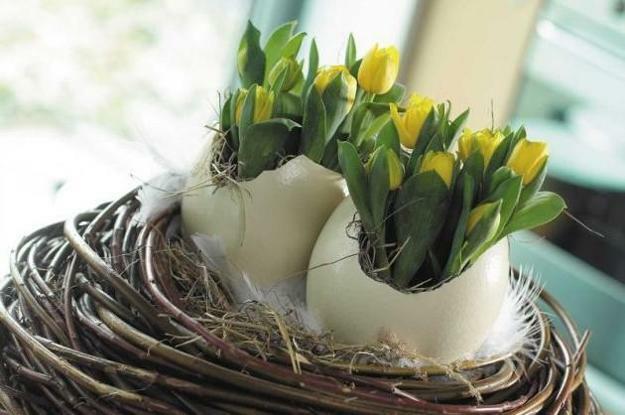 To make freestanding vases, roll the plasticine clay and glue it around the bottom of egg shell vases. 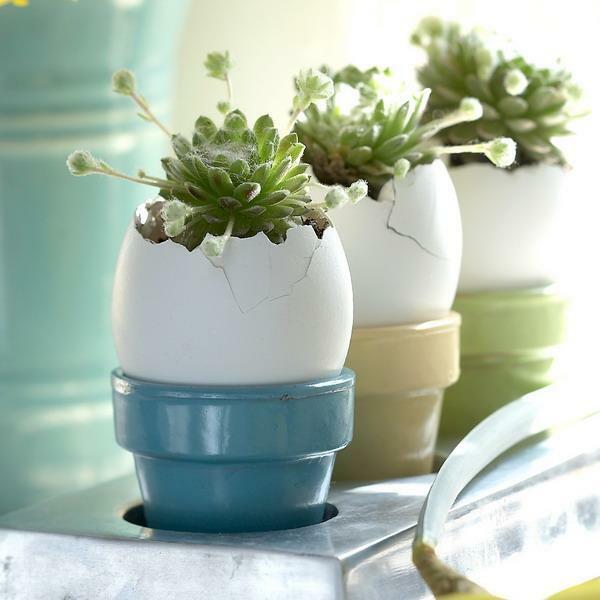 This will give stability to the containers and vases. 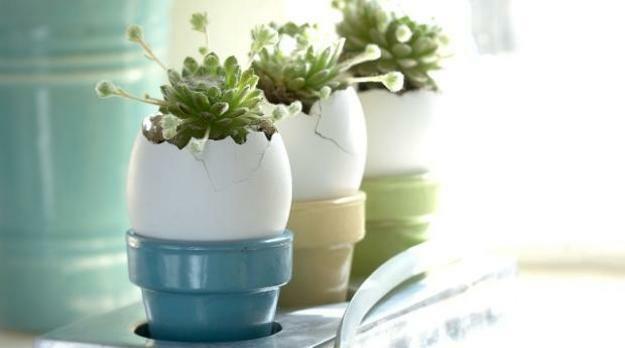 Also you can recycle plastic bottle cups and use empty metal tea-candles holders to glue them to eggshell vases and creating simple stands. 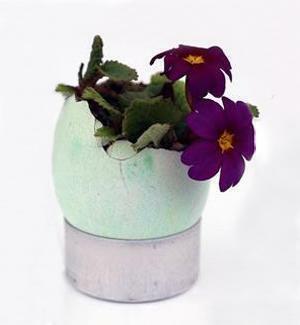 Cut a few short stemmed flowers or tiny branches with green leaves, and arrange them in the eggshell vase, filled with water. 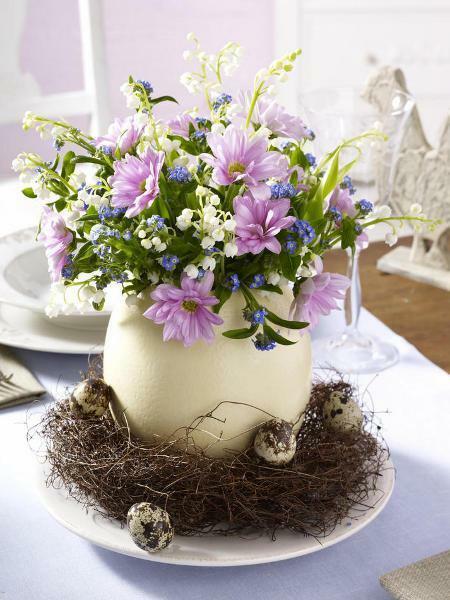 There is nothing more wonderful for Easter decorating than fresh flowers, green grass and leaves on holiday tables.